JOHN SZENT KIRALYI, age 90; beloved husband of Susan (nee Jan); dear father of George, Nicholas and Mia (Donald) Hricko; grandfather of Lucas and Ashlyn Hricko and Taylor Szent Kiraly; brother of Shari Brush. 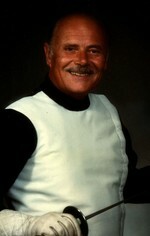 CSU Head Fencing Coach for 26 years. Two time sports hall of famer. Funeral service 10AM FRIDAY IN THE CHAPEL AT SUNSET MEMORIAL PARK 6245 Columbia Rd. North Olmsted where the family will receive friends THURSDAY 6-8 PM. Contributions may be made to West Side Hungarian Lutheran Church 3245 W. 98th St. Cleveland 44102. It is with great sadness I read of a great man’s passing yesterday, John Szent Kiralyi. You must know how much loved he was by his fencing teams over the years, of which I was lucky to be a member and have John as my Coach. I have not met a kinder gentler soul, one who shared his wide breadth of knowledge and taught us with great kindess, and with a spirit that brought such fun to what he did. We were lucky to know him, to be influenced by this great gentleman, and he will be missed and remembered always. God bless you all, his family, and comfort you. Our deepest sympathies our with your family at this time of sorrow.